ASP’s purpose is to connect, challenge and support people who share the vision of a more sustainable society. In pursuit of this vision, we are firm supporters of “purpose led enterprise” (PLE), where organisations define their purpose and measure their success by the value they create for society and the environment, as well as the financial capital they create. 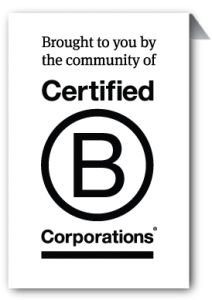 “Certified B Corps” are a great example of for-profit businesses that want to do business differently and be a force for good in the world. They seek to redefine the way success is measured in business by considering their impact on the environment and society as important as their bottom line. The emphasis is on stakeholder interests rather than shareholder primacy. As such B Corps are one clear and tangible form of purpose led enterprise and offer many advantages to people who wish to run businesses, and not-for profits, based on purpose, profitably. B Lab UK (http://bcorporation.uk) is the charity responsible for working with a wide range of partners and stakeholders to see this approach promoted, nurtured and adopted widely across the UK. An important feature of the B Corp movement is the development of a B Corp community, empowered to increase the potential of systemic change. ASP and B Lab UK are keen to promote purpose-driven business, initially in the South West of England. Together we will create spaces and opportunities for the learning, sharing and development of best practice to support the B Corp community across the South West. A growing number of “B Leaders”, consultants with the skills, knowledge and tools to support aspiring B Corps on their journey. ASP are working collaboratively with organisations in the South West, from local authorities to universities to business associations and more! If you’d like to collaborate on the growth of the purpose-led enterprise movement in the South West, please do get in touch. We organised our first South West event in Bristol on 23rd February. Approximately 80 people came along to find out more about the certification, hear from local B Corps, understand how they could be involved and get hands-on experience with the B Corps tools. This event is being followed by a series of local events across the South West to explore and develop the opportunities in the area. We have also established Facebook group “Purpose Learning Community” to facilitate exchange of ideas, news and info, and host conversations and foster connections.